Environment Canada’s Marine Forecast has issued a Strong Wind Warning for western Lake Erie due to predicted high winds tomorrow morning until Saturday morning. Weather forecasts are calling for sustained winds greater than 35 km/hr from the southwest tomorrow morning, reaching 40 km/hr around noon and peaking around 50 km/hr in the early evening. Some forecasts suggest the winds could get closer to 55 km/hr. At the peak winds, gust could reach 75 km/hr. Environment Canada’s Marine Forecast is predicting wave heights to build to 2 m by noon tomorrow. Currently, winds are out of the southwest. 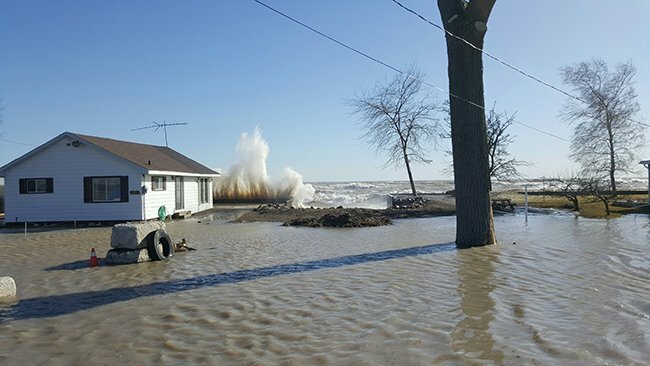 When the wind speeds raise enough, there is a risk that the associated wave action could damage shoreline protection works and cause shoreline erosion along the Lake Erie shoreline in Chatham-Kent and Elgin County. Vulnerable areas will likely see localized flooding due to waves crashing against shoreline protection works spraying water up onto the land. The predicted wind speeds and wave heights are similar to those that caused flooding earlier this year along Erie Shore Drive in Chatham-Kent. Residents along the Lake Erie shoreline should be prepared. This message will be in effect until November 26th, 2017.